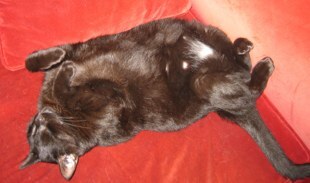 First, a gratuitous cat belly shot. This is Finney resting on the couch, after trying to pull the keys off my laptop, scratch the screen, tear up my papers, eat the isight camera, kill Buddy, kill my shoes, bite my face, knock over the vase on my desk, con me into feeding him breakfast twice and finally pushing the ibook off the desk when I got up to get him a toy. Ah yes, you must be all tuckered out. Rest little devil, rest. Kidnapped. Is that the name? It’s okay. It has the actor who played Fearless in Boomtown, and I love that guy, but he got shot early on and I’m not sure if he’ll be back. I don’t think I’ll watch it again. Oh, the son was good, too. Shark. James Woods is so full of himself and he’s good, but this is very ordinary, otherwise. Not a thing new. I don’t think I’ll keep watching. Six Degrees. I don’t even know why I watched it, but this premiere is the best premiere I’ve watched this season, totally out of the blue. I really liked it. It had something. Did anyone else watch this? Heroes. I”m going to give this a try tonight. PS: To everyone who mentioned Veronica Mars. I tried! I totally expected to love it and didn”t (except I did come to love the father). I don’t get it. All my friends love it. Joss Whedon loves it. It’s almost like some flaw of mine has been revealed. My failure to appreciate it proves that there is something lacking in me.